A scenic trail into the rarely visited Caldwell Lakes Basin on China Mountain. 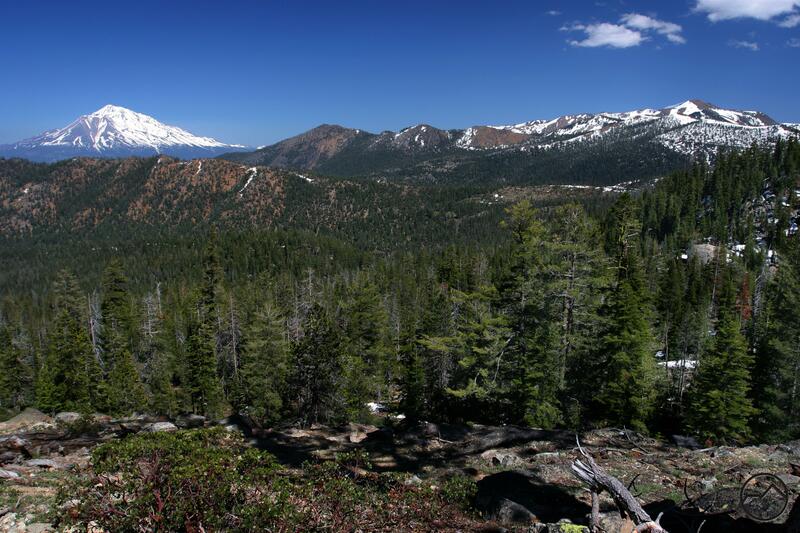 Along the way the trail takes in beautiful meadows, a racing creek and incredible views of Mount Eddy and Mount Shasta. China Mountain rises above Upper Caldwell Lake. 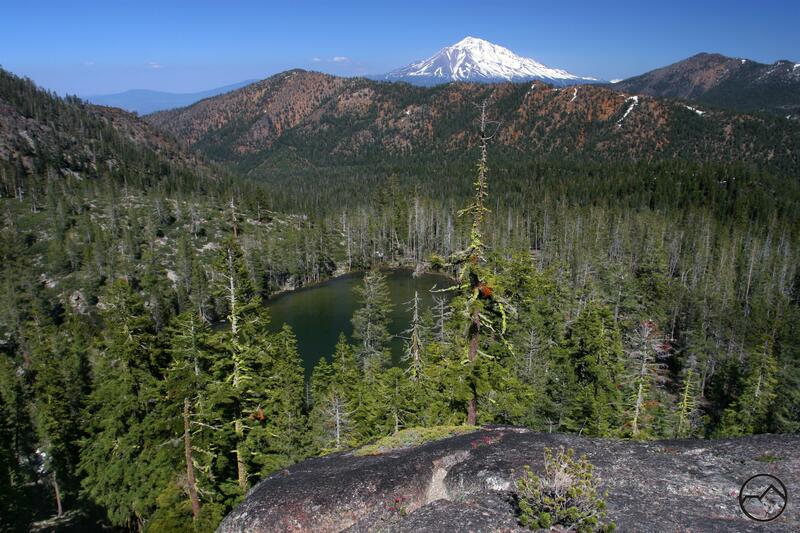 Almost completely forgotten, even by local residents, the Caldwell Lakes Trail is a hidden gem on China Mountain, the fourth highest peak in the Mount Shasta region. Like the trail and the lakes, China Mountain itself is seemingly a forgotten giant. In addition to being an extremely scenic hike to a beautiful alpine cirque, the Caldwell Lakes Trail is an alternate route to the summit of China Mountain. Whether climbing China Mountain or just hiking the trail , a trip to the Caldwell Lakes has many great things to recommend it. The route provides many excellent views, offers chances to pass through lush, carnivorous plant filled meadows, alongside the headwaters of Parks Creek (one of the Shasta River’s largest tributaries), past the Caldwell Lakes, and may include a scramble up the rugged cirque wall below the summit. 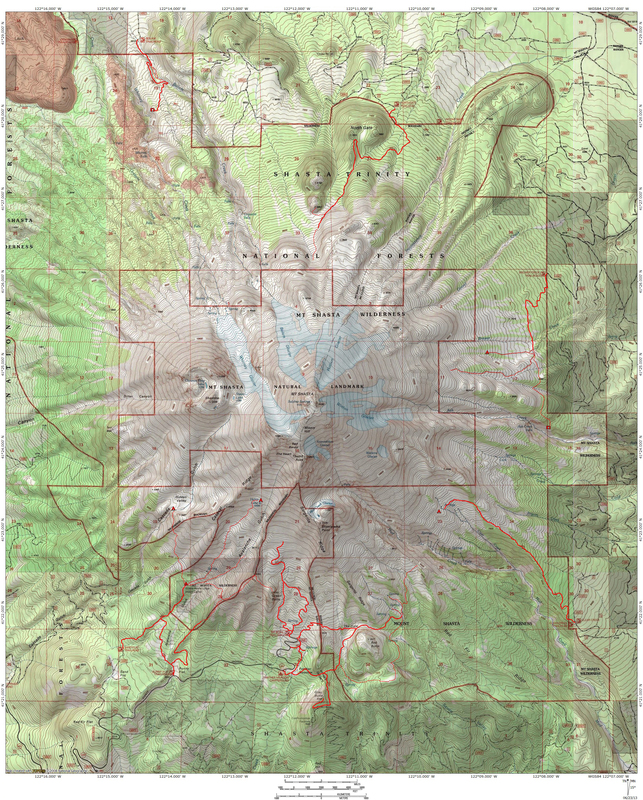 In addition, the route is generally east and south facing, so while other routes and trails in the area may be snowbound, the trail is often clear early in the season, affording the mountain-starved a chance to get into the high country earlier. 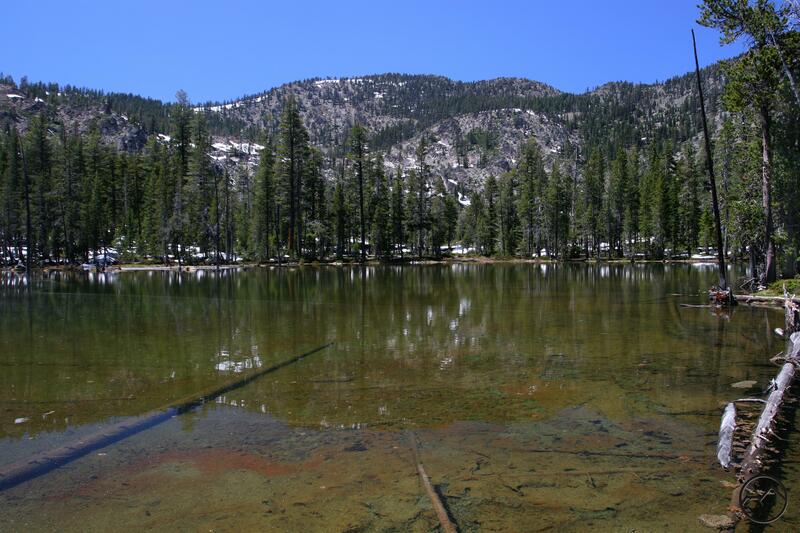 An added bonus is that the Caldwell Lakes are largely unknown and ignored, even by the local population, which means that the area furnishes one a good chance of having the lakes basin and the mountain to oneself. Meadow along the Caldwell Lakes Trail. The trail to the Caldwell Lakes begins 0.5 miles up a dirt road off of Forest Road 17. Although a high clearance vehicle could cover that half-mile, it is generally easier to just park off of Forest Road 17 and hike the 0.5 miles of dirt road. While roads generally make for less than desirable hiking, this is somewhat alleviated to the presence of Parks Creek, which just to the south of the road. After following the roadway at a moderate grade for 0.5 miles, the road comes to an end. This is the most confusing part of the trail to the Caldwell Lakes. At the end of the road, there is a large pile of rocks, behind which is a dirt mound. Beyond these two landmarks is a large meadow with Parks Creek coursing around its southern perimeter. About 30 yards prior to the rock pile, a trail branches off to the right and climbs above the meadow. If one misses the trail’s turnoff it is easy to still reach the trail by passing through the meadow and then climbing up the bluff on the northwest side of the meadow. Due to the abundance of carnivorous Darlingtonia, the meadow route is actually the more interesting way to go. Mount Shasta and Mount Eddy from the Caldwell Lakes Trail. 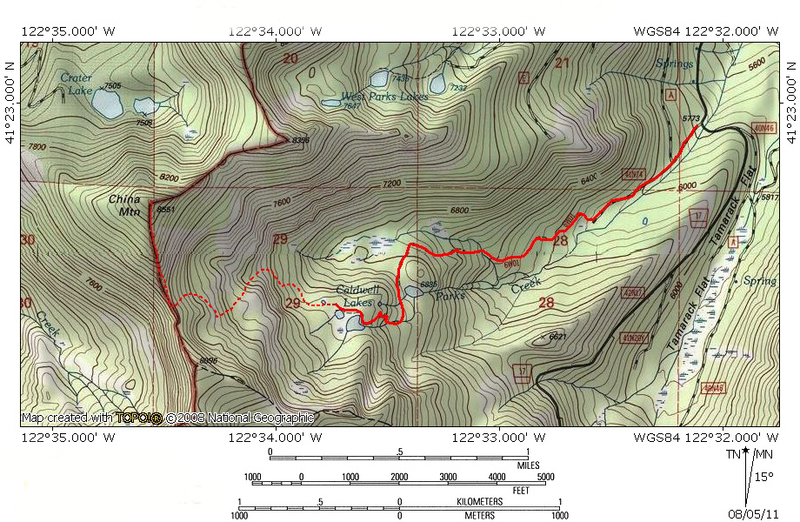 Once on the trail, the route climbs moderately in a westerly direction. Views of Mount Shasta are good (though they improve considerably as one progresses). The trees thin out and the route is generally open. Gray, rocky crags rise overhead to the west, marking the beginning of the the Caldwell Lakes’ cirque. Although Parks Creek can be heard, it is no longer visible. 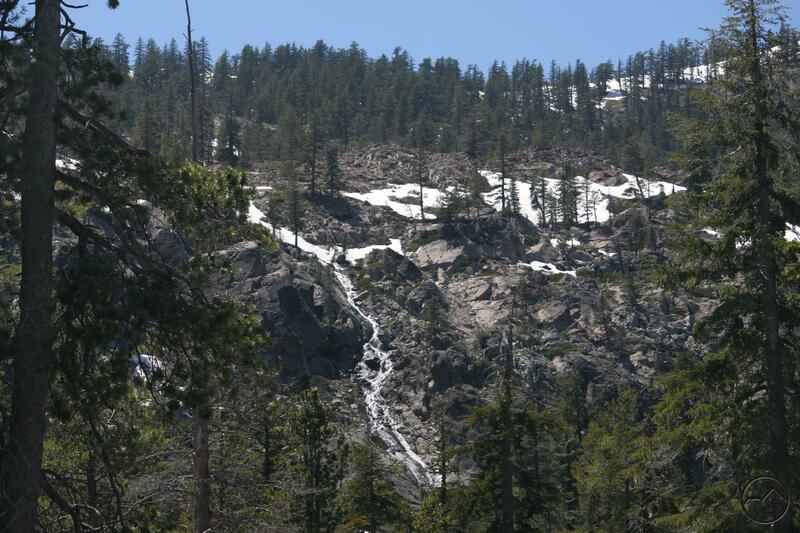 Surprisingly, though the trail is seldom used, it is in excellent condition and easy to follow. About 0.5 miles from departing the road, the trail crosses one of the forks of Parks Creek. 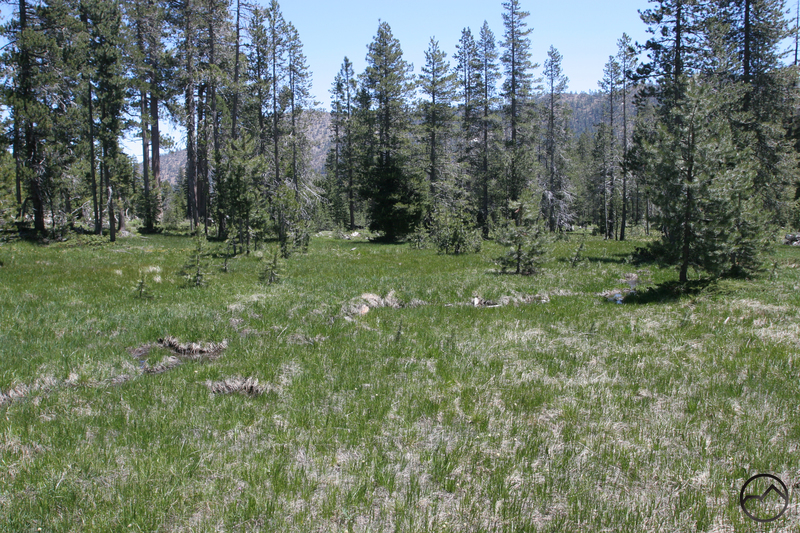 This fork does not originate from the Caldwell Lakes, instead coming from an extensive network of meadows in a canyon about 200 feet below Upper Caldwell Lake. After crossing the creek, the trail enters thicker forest cover and continues climbing for 0.35 miles. The trail passes through rockier terrain, generally devoid of brush, unlike the previous section of trail on the other side of the creek. Mount Shasta highlights the view beyond Lower Caldwell Lake. At this point the trail makes a discernible turn to the south and passes below a rocky cliff. If one wishes to go to Parks Creek Meadows, this is the point to depart the trail. Simply follow the creek to the meadow, which are fairly extensive and have some shallow ponds dotting the grassy fields. The main trail continues to the south. After a short distance a cairn marks the easiest way to descend 100 feet down to Lower Caldwell Lake. The lake itself is tree-bound and does not have great views. The creek enters from the south and can be heard from the trail. Scrambling up the cliffs above the lake provide the best views. From here one can observe Lower Caldwell Lake, Mount Eddy and Mount Shasta, as well as much of the northern Eddy Range. This is one of the better vistas on the hike. China Mountain towers above Middle Caldwell Lake. Back on the trail, the route begins to climb to the west after passing Lower Caldwell Lake, coming back into proximity to Parks Creek. The creek fans out along this section of trail, coursing through numerous small channels. After following the creek briefly, the route begins to switchback through an open, rocky area. Views of Mount Shasta to the east are great. The switchbacks end as suddenly as they begin and deposit one at the mouth of Middle Caldwell Lake. The rocky cirque comes as a bit of a surprise, with stark gray cliffs climbing up to the summit of China Mountain, which is presides 1,400 feet above the basin. Small Upper Caldwell Lake is just beyond the larger middle lake. When the water level is high the distinction between the two lakes may be imperceptible. These cliffs must be climbed to summit China Mountain. 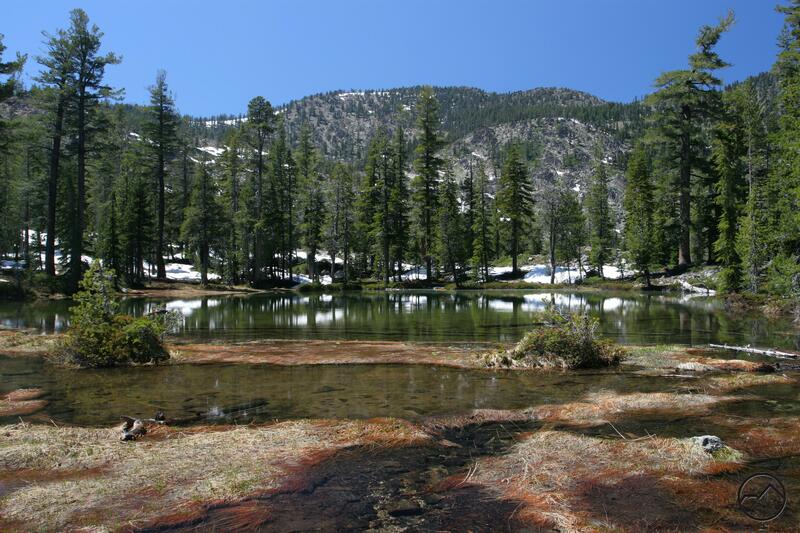 To climb China Mountain, hike to the end of Upper Caldwell Lake and then head through the forest toward the large cliffs. Just north of this point, the bench containing the lakes drops off steeply toward meadows that are the true source of Parks Creek. Stay to the west, heading towards the cliffs. Though they look difficult and somewhat impenetrable from a distance, there are numerous routes to climb through them. One must climb 850 feet up the cliffs to reach the saddle of the knife-edge that is traversed by the scramble stemming off of the PCT. There is a bench about halfway up and the route is more forested and the cliffs fade out for the upper portion of the ascent. Once reaching the saddle, simply scramble another 700 feet up to the summit. From Mount Shasta City, drive north on Interstate 5, through the town of Weed. Exit at the Edgewood/Stewart Springs exit. Turn left and drive under the freeway, then turn right onto Old Stage/ Old 99. Continue north for a couple hundred yards and then turn left onto Stewart Springs Road. After 4 miles, Forest Service Road 17 splits off to the right. Follow this road 5.4 miles and park at the beginning of road 41N74. I have great memories of hiking with my dad and brother when I was a kid (about 63 years ago) when we had to start from Stuart Springs! The IP road wasn’t built for several more years…we caught nice trout in upper and lower Caldwell lakes….